Charlie Potts, Attorney - Briskman & Binion, P.C. Charlie was born as well as reared in Mobile. He earned a B.A. in English Literature from The University of the South (Sewanee) (C’79) and his J.D. from Samford University’s Cumberland School of Law (1986). He is a member, in good standing, with the Alabama State Bar (1986) and the Mississippi State Bar (2004). Charlie has also been an active member of the Mobile Bar Association where he served as past chair of the Archives and History Committee. He was also instrumental in the publication of a history of the Mobile Bar. The bar was titled Mobile’s Legal Legacy: 300 Years of Law in the Port City (Association Publishing Company 2008). He joined Briskman & Binion in 2010. Charlie has extensive experience in jury and non-jury and appellate civil practice. He has personally tried to verdict in excess of 60 cases thoughout Alabama and Mississippi, in state and federal courts. These cases include medical malpractice/long term care, insurance/bad faith, fraud, products liability, construction and transportation, premises and automobile liability, and maritime and state law based personal injury/wrongful death matters. He has been able to achieve a high degree of success on behalf of his clients. Like the other members of Briskman & Binion, Charlie enjoys an excellent reputation among the Mobile and Baldwin County Bench and Bar for providing aggressive, quality legal services. Admitted to the 5th and 11th United States Courts of Appeal, as well as the U.S. Supreme Court, Mr. Potts has also served as first chair in oral arguments before the 11th Circuit and the Alabama Supreme Court. 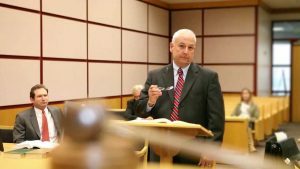 He is also a mediator with the Alabama Center for Dispute Resolution and he is regularly appointed as mediator by a number of Mobile County circuit judges to help litigants resolve their claims to avoid the costs and risks that one associates with taking matters to trial. When not handling matters for his clients, Charlie enjoys history and he has been focusing lately on the American Civil War, science, travel, sports, and the arts, particularly the Mobile Symphony. He is married to the former Susan Lloyd of Mountain Brook, Alabama. They have three daughters, Nolen, Haley and Deborah Jane and they attend Ashland Place United Methodist Church.